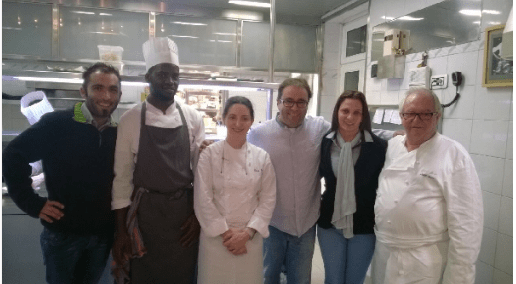 The chef at the Hotel Restaurant Cala Jóncols, Morgan, is constantly expanding his experience of the gastronomic world, adding to the wealth of knowledge he has acquired working alongside Rosario, the mother of the current owners. This winter, he has spent three months in the kitchen of the prestigious restaurant Arzak in San Sebastián, where he has had the opportunity to work with the very best cuisine that this family restaurant offers its diners. During his time there, Morgan has learned a lot about top gastronomy, but also in terms of organizational aspects. Rosario is the pillar on which this restaurant kitchen is built, together with Morgan, and all of the dishes bear her hallmark. Every winter, Morgan spends time gaining an in-depth insight into the best cuisine from different countries, enabling him to incorporate constant improvements while always respecting the restaurant’s roots, that are held in high esteem by the guests at the cove. He has spent time working in the German restaurant Wok and Go, Cabeza Rubia in Cáceres, and Aux Pyrenées and Au Goût des Autres in Toulouse. Morgan’s innovate dishes include grilled octopus, raviolis with scallop and salmon marinated in coffee.